I maintain a blog on shitcoin.com where I review blockchain products. My next review will be of Dash. I'm nearly done with the goals, including 7 and 8. The last goal will be to create a proposal, which you are currently reading. Inception! - I will liquidate 5 DASH and spend exactly that amount of fiat as the budget for the ad campaign. Screenshots of ad spending will prove that I used the funds as promised. You should postpone voting until the review is published. What will the review/ads look like? 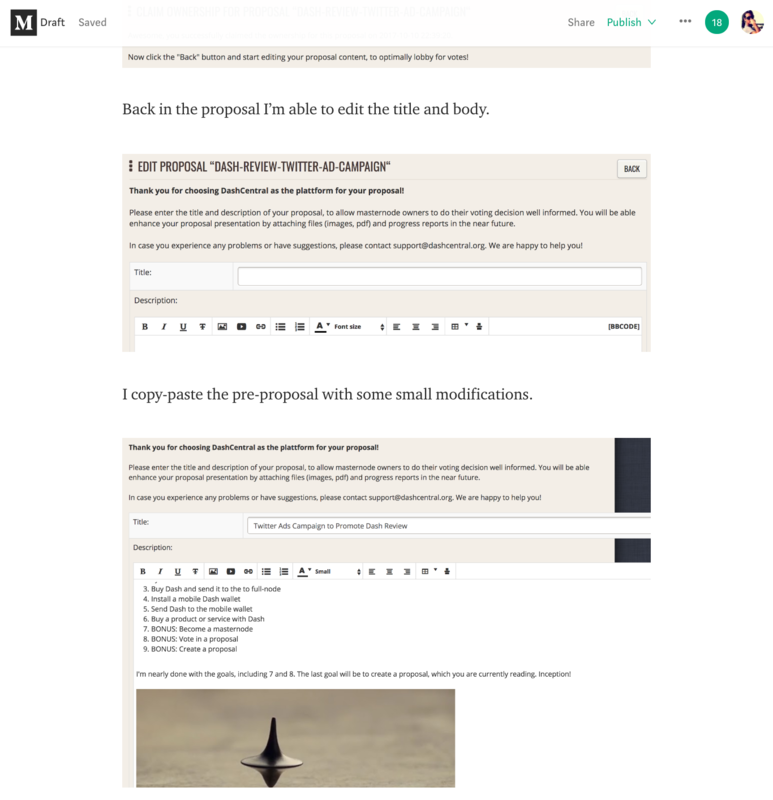 I will edit this proposal body once the review is finished to include a link to the review. The review is so far positive. The Twitter ads campaign will promote a tweet that links to the review with a clickbait-y title. It will focus on the parts I find good about Dash and the parts I find bad. People do not click neutral ads. ï»¿Shitcoin.com reviews have so far received between 4,000 and 40,000 views. - I'm having issues getting the ads approved by Twitter. Will try to post them from my personal Twitter account instead. Just as an update, I'm beginning to run ads soon! Twitter stopped my ads due to some policy violation and won't respond to my support inquiries. I am working on a solution. The shitcoin.com doimain is pretty cool. Welcome to the Dash community! Giving you 12 yes votes, sorry it probably won't be enough. Started a masternode on a whim? Wow, Mr. Money Bags! Glad to have you. Voting YES for tutorials and how-to videos, especially at this price. Yes, this is the last piece of the review that needs to be done, the proposal to the DAO. At least you need to take your 5 Dash back. i like the review! Yes! How good is a review if we are paying for it? OK, I see now that you went above and beyond risking more than you're asking for to do an unprecedentedly thorough user review, with making a proposal part of it. Kudos to your work (which isn't being paid for) I will vote yes. My only suggestion about your article is that you don't need to own a masternode to create a proposal. This is an important aspect to show that anyone with 5D (or a sponsor like InstantKarmaFund.org) can create a proposal and get paid by the Dash Treasury. I hope you edit this section ASAP. IMO the review provided has shown competency, humour and value. Yes from me. I read the review and I like the no nonsense approach. I think this is good for Dash and the cost is reasonable. 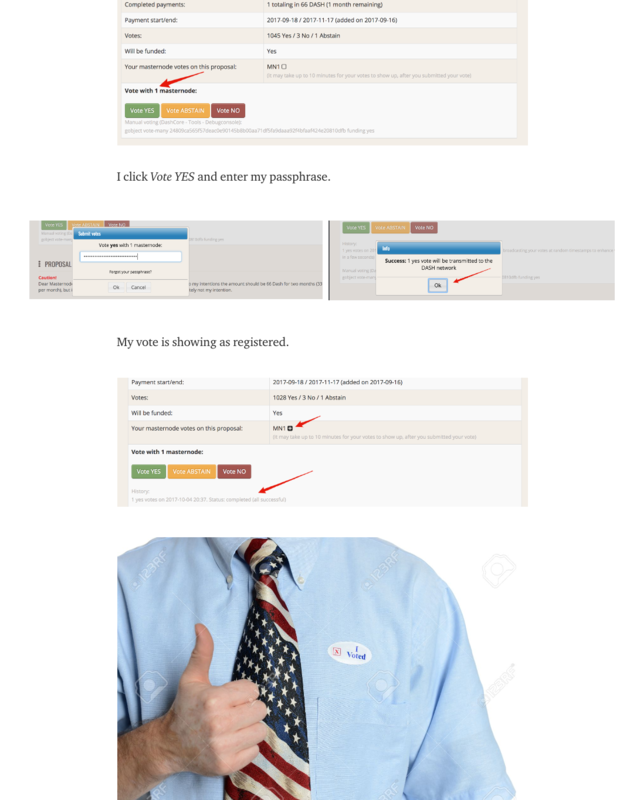 Voting yes. I have to say i'm pleasantly surprised by your review of Dash, i like the whole presentation of it. voting no. Don't want to pay to promote a review of Dash on shitcoin.com. Why would Dash want to be associated with a site called shitcoin.com? Dumb. Seems to have already done more than half the job and in a reasonable way for a reasonable amount of Dash. Voted yes. Just read your review. Thumbs up on the approach you've taken! However, when I started to read it my first thought was "Oh no, he's going to use the unreleased and probably unstable development branch with his $300.000 MN!!!! whooooaaaa \o/"
I'm voting yes as I know the guy who is making it and actually was the person who introduced him to DASH on bitcoin channels. He just bought a masternode to test out dash. He is very vocal in the bitcoin community, and 5 DASH is a bargain for the work he has done up till now and will do honestly promoting us. He is not doing it to make 5 DASH, as I'm sure he doesn't care much about 5 DASH, but to write a review on the budget system and get a total feel for DASH that he can share. 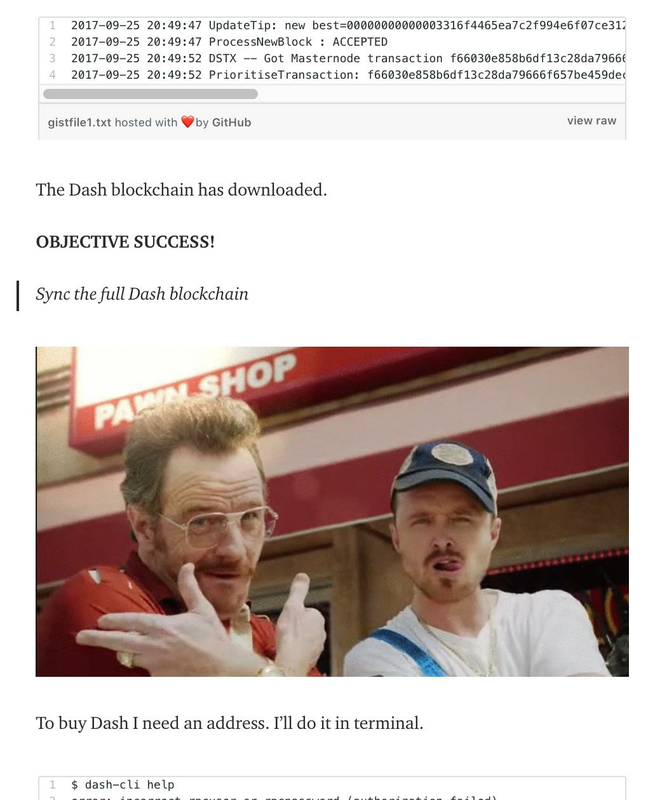 The 5 dash will go to an ad campaign for the DASH review. Do you have a portfolio of producing this type of content? For example, not all udemy classes are of the same production quality. "The DAO pays for -advertising- that promotes the review"
What we get out of it is online advertising to a review about Dash. What you get out of it is more hits to your website. Very cool site, I bookmarked it a month or so ago after reading the storj review. I don't really like the name of the site but the review was very technical and top notch overall. You have my yes votes! There is one concirn i see here. Why would we need payed promotions? The first thing people notice on reviews is payed review. If the review is needed, it should be done with your own desire to do that and not to get money out of it and make "fake" reviews to your followers. Personally, i would like for Dash to have honest reviews even if it's have some criticism than to hail it with fake reviews. The review is a technical review. I install as much as possible from source-code and guide the reader through the process. Please read the proposal again. The DAO pays for -advertising- that promotes the review. I do not benefit financially from my writing. It's a hobby.